Allow me to introduce Manuel De Los Reyes Blanes Moreno, better known as Manolo to his friends. Manolo is a Lizard canary breeder and Vice President of the Club Amigos del Canario Lizard. He is also an inventor, the bird-keeping equivalent of ‘Q’ in the James Bond films. The black box that he is carrying might look like an ordinary briefcase but it is actually a folding photo cage. Never seen 007 use one of these, but it’s just as clever and much more useful than most of Bond’s high-tech gadgets. The box splits into two halves, with the lower half forming the base and the upper forming the lid. The latter is fitted with LED lighting; you can even have disco colours if you want. Then the photo cage unfolds like a piece of origami. The hinged side panels form the walls of the cage and incorporate all the features you could possibly need: a circular cage door, and apertures for photographing the bird from the side or from above. The perch can rotate to achieve any angle you want and is remotely controlled by a thumb wheel. It really is a box of tricks. Manolo’s photo cage has three big advantages: portability, a reliable source of light, and the absence of wires between the bird and the camera. 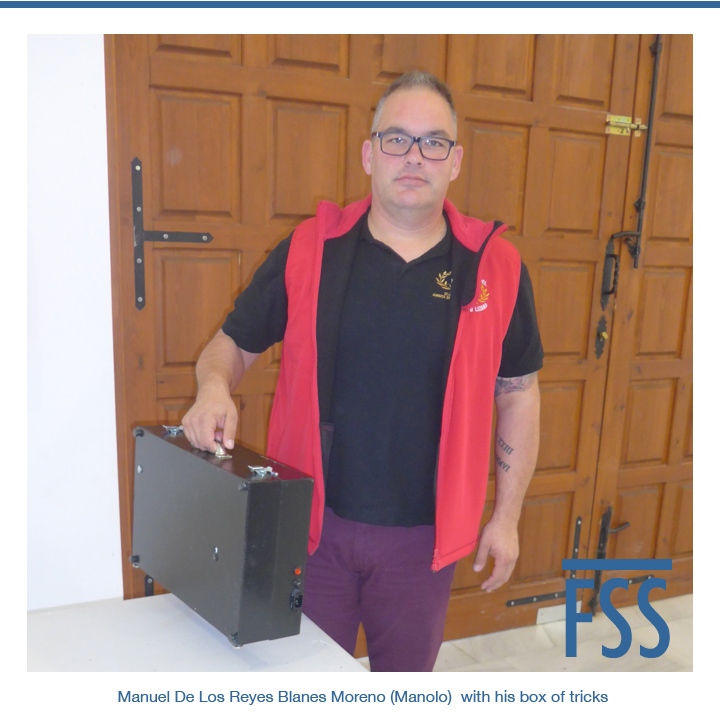 All you need is a power supply, although I bet Manolo could come up with a battery operated or solar powered system if you want total independence. Drawbacks? Three spring to mind. The first is that you are dependent on the colour accuracy of the LED lighting, but in practice LEDs are likely to be far superior to the lighting available at most show halls. The second is that there are only two viewpoints, although that is something that could probably be increased. The third, and most important, is that when Manolo demonstrated the photo cage to me, the bird was caught by hand to place it in the photo cage, and again when it was returned to its show cage. Hardly ideal when you want to photograph a Lizard’s spangles. Is it the best way to photograph Lizard canaries? No, because natural light will produce the most realistic results, but that is not usually an option at bird shows. Manolo’s photo cage is a brilliant invention, and it should get better as he continues to refine his concept. Bravo! 1. You must use your real name - you know mine. 2. Your first comment will be moderated, so there is likely to be a delay before it is posted. 3. Traditional standards of civilised debate apply. 4. Please keep to the topic. 5. Respect the aims of this blog (see Introduction). If everyone sticks to these rules there will be no need for any others. Copyright on all content is reserved. If you would like to reproduce anything from this blog, in its entirety or in part, you must obtain my written permission first.